I just installed Multiplicity on my laptop and my desktop everything says it's connected. My laptop is my primary. So my question is, how on my laptop do I see my desktop? There is no icon on my screen to connect or see my desktop, there is no command in my right click and the icon in my taskbar only shows the config window. I read the manual and watched the video. It never shows you how to use it. I set a Hot Key to switch, but all it does is make my cursor shoot to the right side of the screen. Just set that up myself yesterday. There is a setting as to whether you are using side by side monitors or one for both. Sounds like you may have this set wrong. If you don't figure this out tonight, I'll check tomorrow and post that setting. Hopefully that is your problem. I had to uninstall on both machines. On my secondary or my desktop when I put my cursor on an icon all the icons in a folder or on the desktop would be selected. I don't know if Multiplicity caused this but when I uninstalled it everything cleared up. I just connected the 2 together using Network sharing. All I wanted to do is copy files between the 2 computers. I think the instruction should show how to get to the split screen. The video shows how to set it up and then it shows the split screen, but it doesn't show how to get there. 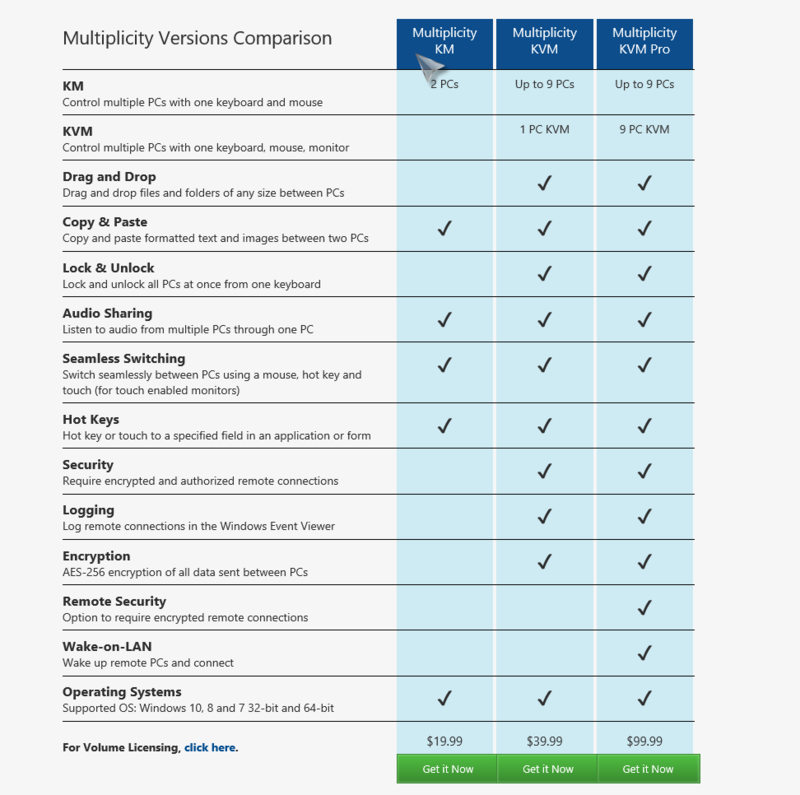 Ok. Firstly, which version of Multiplicity did you get? Only the KVM version will let you see the other screen on your laptop display. Without the KVM version, you can just control 2 PCs with one keyboard and mouse. If the secondary is on your right, move the mouse off the right side of the screen to control the secondary. Opposite if it is on the left. 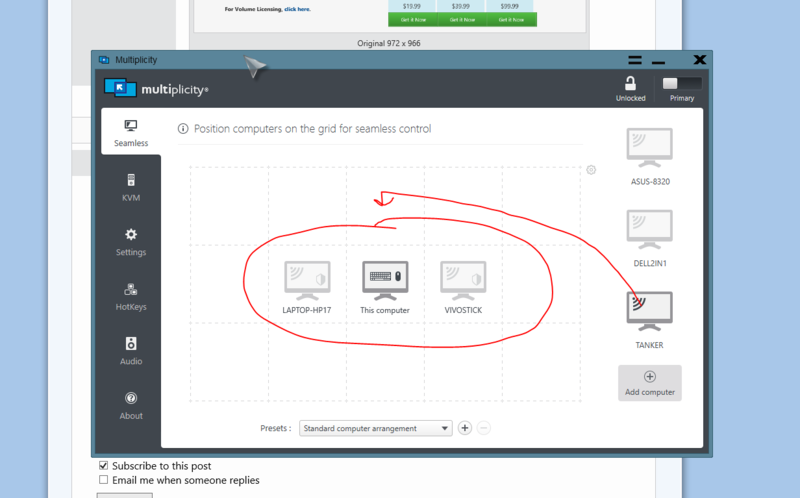 If you got the KVM version, you can hit KVM on the left side of the above screenshot, choose the secondary, click connect. Secondary will show up on your laptop screen. Mouse to top to disconnect. You can run in windowed mode so you can have split screen. It just says Multiplicity 3 in my downloads. I'm guessing that's not KVM version. That's probably why I couldn't see the split screen. Still couldn't figure out how to send files between computers. Copy & Paste, as simple as that. But my understanding to date was You need one monitor on EACH PC unless You use KVM with Pro. Yes, and, of course, you need to be able to see the other monitor. Like, in the same room. Only the KVM versions will allow control of a PC with no monitor connected to it. Yep, just your power cord and in my case an Ethernet cord. Though I suppose Wi-Fi would do the trick as well. Works great! Especially cool is the wake on lan, which I don't think the WiFi would work with, correct? Especially cool is the wake on lan, which I don't think the WiFi would work with, correct? Wake-on-LAN is dependent on two things: your motherboard and your network card. Your motherboard must be hooked up to an ATX-compatible power supply, as most computers in the past decade or so are. Your Ethernet or wireless card must also support this functionality. Because it is set either through the BIOS or through your network card’s firmware, you don’t need specific software to enable it. Support for Wake-on-LAN is pretty universal nowadays, even when it’s not advertised as a feature, so if you have a computer built in the past decade or so, you’re covered. For those of you who build your own rigs, take care when buying an Ethernet card. While most built-in cards on motherboards don’t need this step, discrete network cards often need a 3-pin cable attached to the motherboard to support Wake on LAN. Do your research online before you buy, so you’re not disappointed later on down the line. RedneckDude, thanks! Very interesting/illuminating read.